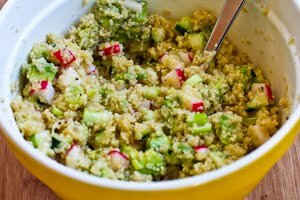 This tasty Quinoa Salad with Avocado, Radishes, Cucumbers, and Cumin-Lime Vinaigrette is refreshing and healthy, and this recipe is low-glycemic, gluten-free, vegan, and South Beach Diet friendly! Use the Recipes-by-Diet-Type Index to find more recipes like this one. Do I dare confess that I was completely surprised by how much I enjoyed this Quinoa Salad with Avocado, Radishes, Cucumbers, and Cumin-Lime Vinaigrette? 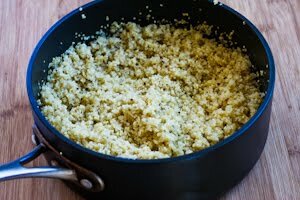 I’ve definitely been a slow adopter when it comes to quinoa (pronounced keen-wa) but recently when I wrote about cooking with quinoa for BlogHer.com, I made a promise to myself that I would try using it. Quinoa is loaded with nutrients, as well as being gluten-free and a source of complete protein, and it has a pleasant, somewhat nutty taste and slightly crunchy texture. 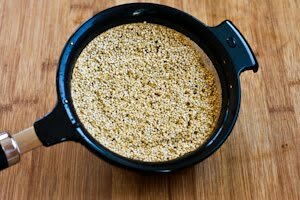 Now that I realize I like quinoa so well, you can bet I’ll be trying other experiments with this interesting seed that’s cooked as a grain; meanwhile if you’re also a quinoa novice, give this tasty salad a try and see what you think. 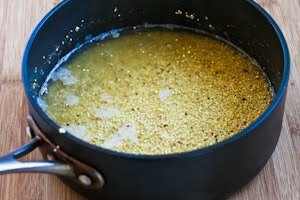 Nearly all quinoa has to be rinsed well with cold water, because the seeds are coated with saponins, which give the quinoa a bitter taste if they aren’t rinsed off. You’ll need a very fine mesh strainer, or you can use a paper towel inside a strainer to catch the tiny quinoa seeds. While the quinoa is cooking, dice the avocados and toss with lime juice, thinly slice green onions, and chop radishes and cucumbers in same-size pieces. I left just a little cucumber skin for color, and scraped out the seeds so the cucumber wouldn’t make the salad watery. Here’s how much the cooked quinoa expanded (about 3 times the volume.) When the water is all absorbed, let the quinoa cool a little and then fluff with a fork. I cooled it in the salad bowl for about 30 minutes before I mixed the salad together. While the quinoa cools, whisk together the lime juice, cumin, Spike Seasoning, Vege-Sal (or salt) and olive oil to make the dressing. 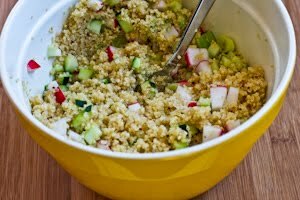 When the quinoa is cool, mix in the diced radishes, diced cucumbers, and thinly sliced green onions. Then gently stir in the diced avocadoes, season to taste with salt and fresh ground black pepper, and serve. This was okay after being in the refrigerator overnight, but I don’t think it would keep for more than a day or two without the vegetables losing their crispness. Let the cooked quinoa cool for a few minutes, then place in salad bowl, fluff with a fork and cool until quinoa is room temperature, about 15-30 minutes. While quinoa cooks and cools, peel avocado, dice into 3/4 inch pieces, place in small bowl, and toss with 1 T fresh-squeezed lime juice. 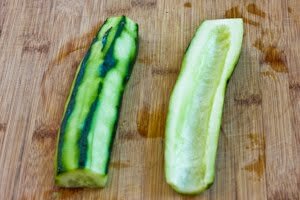 Peel cucumbers, leaving thin green stripes, scrape out seeds, and dice cucumbers into 1/2 inch pieces. Cut off root and stem end of radishes, wash if needed, and dice into 1/2 inch pieces. Thinly slice enough green onions to make 1/4 cup. 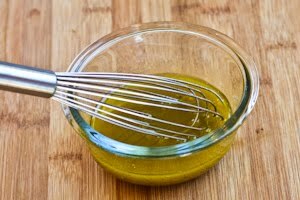 In a small bowl, stir together the 3 T lime juice, ground cumin, Spike Seasoning, and Vege-Sal, then whisk in the olive oil. 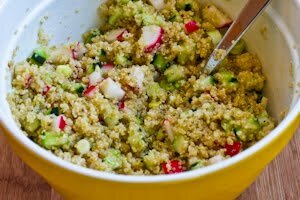 When quinoa has cooled to room temperature in the salad bowl, stir in the diced radishes, diced cucumbers, and thinly-sliced green onions. (Don’t add avocado until the end.) Stir in enough dressing to moisten salad to your liking (you may not need all the dressing.) Gently stir in diced avocado, season to taste with salt and fresh ground black pepper, and serve immediately. This was okay when I kept it in the fridge overnight, but I don’t think it would keep for longer than a day, and it was better freshly made. Even though quinoa is technically a seed and not a grain, it’s considered phase two for the South Beach Diet. 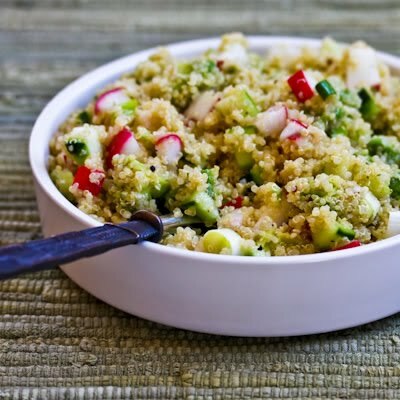 Quinoa isn’t super low in carbs, but it’s high in protein and has some fiber; if you want a lower-carb version of this salad use more cucumber, radishes, and avocado and less quinoa. Looks great, sharing on my post today! Amy, so glad you enjoyed it, and thanks for the vote of confidence for my blog. I do appreciate the nice feedback so much. I was looking for a gluten-free side dish for my husband, and since Kalyn's Kitchen is my go-to website, typed in "quinoa" and found this. Absolutely delicious! I prepared all the ingredients ahead of time and then mixed up 1/2 for dinner, then plan to have the rest for lunch today. The combination of the nutty quinoa, crunchy veggies and smooth avocado is just wonderful. Certainly I think you could add other ingredients that you like, but I think I'll leave it just as is! Thank you once again, Kalyn.